Please note that the content of this book primarily consists of articles available from Wikipedia or other free sources online. Dulce María (born Dulce María Espinoza Saviñón, December 6, 1985) is a Mexican actress, singer, and songwriter. In October 2009 she signed a contract with Universal Music and recorded a solo album Extranjera, with its first part released in November 2010, and the second part in June 2011. Dulce María Espinoza Saviñón was born on December 6, 1985 in Mexico City, Federal District. She has two sisters, Blanca and Claudia. 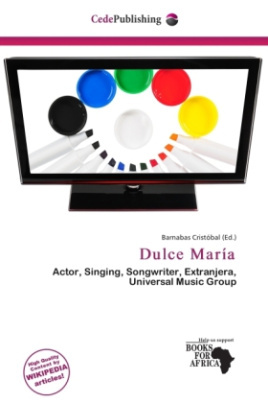 As a child, Dulce María began doing television commercials. In 1993, at the age of 8, she was cast on Plaza Sesamo, Mexico's equivalent to Sesame Street. She also appears in various mexican commercials during her young ages, including the mexican furniture store Viana, during mother's day.